MARRY ME, JUST FOR TODAY? Women are allowed to chant the Scroll of Esther on behalf of men if no competent men are available, Rabbi Ovadia Yosef, the spiritual leader of Israel's Sephardi community, ruled last week in a landmark decision liable to outrage many of his Ashkenazi counterparts. Esther is traditionally read in synagogue on the holiday of Purim, which this year falls next week. And while some rabbis have long permitted women to read the megillah, or scroll, for other women, most do not allow women to read on behalf of men. In his weekly Torah class on Saturday night, however, Yosef discussed the rules of reading the megillah and ruled that not only may women read it in front of men, but the men will thereby have fulfilled their obligation to hear the scroll read. "It is permissible for a woman to fulfill this obligation on behalf of men," he said, because the obligation to hear the megillah falls equally on men and women. Yosef said that most rabbis forbid women to read the megillah on the grounds that men are forbidden to listen to women sing, because a woman's singing voice can stimulate sexual arousal. However, he said, he does not agree that a woman chanting a sacred text is the kind of singing that stimulates sexual arousal. The analogy rabbis have drawn between singing and chanting sacred texts has "no value," he declared. Yosef said women should not read for men if there are men capable of doing the reading. But in a "small community" where there are no men capable of chanting the text properly, it is permissible to bring a woman to read, he ruled. Yosef also said that women could write a kosher Scroll of Esther - another task that most rabbis say can be done only by men. He said that ancient megillahs written by women have been found in Yemen, and it would be permissible for women to do so today as well, "to earn a living for their household," since women "were part of the miracle" that the megillah describes. However, he admitted wryly, it is an open question "whether anyone would buy it." In both cases, Yosef's rulings were specific to Megillat Esther and do not necessarily apply to other sacred texts, such as the Torah. Technorati tags: religion, religion and philosophy, Judaism, Jew, Jews, Jewish, Torah, Canada, Canadian, journal, weblog, blog, diary, soferet, sofrut, safrut, scribe, art, thoughts, stam, feminism, ritual, women, woman, life, sofer, Technorati. In addition to so many issues with my e-mail address & mail program, my laptop also managed to die while I was teaching at Limmud & Cambridge University in the UK. This means that I have not been able to access certain vital information, such as client contact information. If you wish to communicate in an effective & timely manner now with me, best to leave a message in the "comments" section here & I'll respond when I'm next able to be online. Please accept my apologies for the difficulties my software & hardware has posed. As soon as I can resolve this, I'll be in touch, as I'm so looking forward to continuing our work together. Thank you once again for your patience & for the great honour of writing your Torahs & Megilot, & bringing them back to life. I received confirmation today that I'll be teaching once again at the ALEPH Kallah, thank G@D. It's a biannual Jew-do put on by the Alliance for Jewish Renewal, where they make Yidden of all stripes comfortable: the food is kosher, multiple minyanim are available, & Shabbes-keepers are put together. This is a week-long singing, dancing, drumming, dancing, praying, loving, eating, learning Jewtopia. It's in New Mexico next summer. Check it out. Shabbat shalom ve-chag Chanukah same'ach! My friend Rory & I did these t-shirt designs together - ok, all I did was the Hebrew script, my own design called "Qeset Ha-Soferet" & first published by MySpace. & I did the writeups on the tags, but everything else was her idea - she's the brainchild. 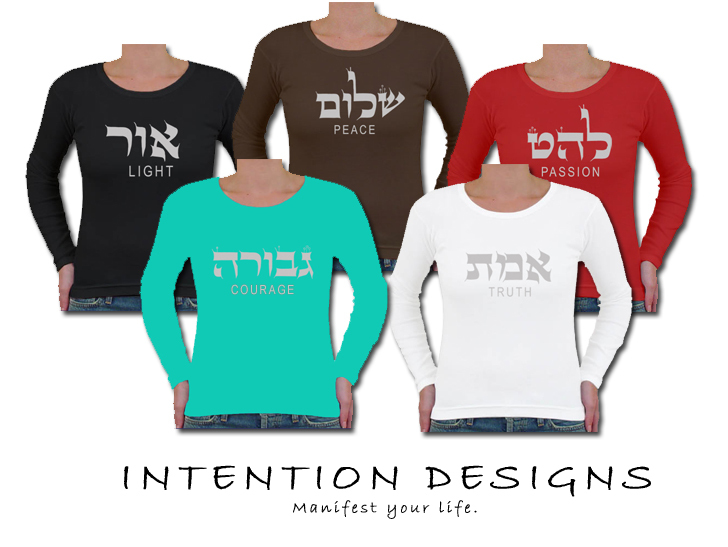 Anyway, each shirt sports a powerful Hebrew word, as an intention the wearer wishes to put out into the world or carry within themselves. They're meant to be inspirational spiritual gear. Interested? They're for sale at PURE here in Vancouver, or you can just e-mail Rory. An elderly homeless man stretched his arms wide to me as he asked this a few hours ago. I smiled & blessed him instead. I haven't blogged in almost a month, as I have been occupied with catching up on overdue work, preparing for my next teaching engagement, checking in with my mum over medical issues, avoiding a stalker, attending religious & political lectures & moving out of my apartment. Va-yomer Y-H-V-H el-Avram, "Lekh lekha mey-aretzekha u-mi-moladet'kha u-mi-beyt avikha el-ha-aretz asher areka"
"Now G@D said to Avram: 'Get yourself out of your country, & from your birth-community, & from your father's house, to the land that I will show you'. "Lekh" means "go" in the masculine imperative. "Lekha" can be interpreted as moving towards one's Self. Go inside & discover the Great Mystery which is You. This is the beginning of the journey of Av Ram - the Great Father, or "Big Daddy" (hat tip to Danya!). It's the vowels which differentiate the one from the other. There is a midrash which teaches us that while we grow in our mother's womb, an angel teaches us the whole Torah, then touches us on the philtrum to cause all we've learned to rest in our subconscious. We then spend our entire lives seeking the wisdom which already lies within, by having what are popularly called "learning experiences". When you look at the letters of the words "lekh lekha", they illustrate the path we take to return to our true selves. The letter Lamed (ל), whose root means "to learn" & whose pictographic shape is that of a goad, reaches higher than any other letter of the Alefbet. The letter Khaf (ך) means "palm of the hand", the thing we grasp with, & in its final form drops low down. With these letters we can learn that the journey of returning to ourselves requires learning lessons & grasping those lessons. & that the learning experiences may bring us to the very heights of joy, or to the depths of despair. Or both. & that these are necessary steps along the way. Va-yomer, "Lo tukhal lir'ot et-panai, ki-lo yir'ani ha-adam ve-chai"
Because the essence of each & every human being is tzelem El@qim, the image, or the shadow, of G@d. Our souls are each a sacred spark from the One Source. May we all be blessed to accept our lessons graciously, learn them so as not to have to repeat any, & have faith in the loving G@d who teaches us these lessons while we navigate the difficulties. May we all know our true selves. You can see the kindness in this man's face, can't you? ...for such is Hallowe'en in Canada. I hadn't met with R' Weiss in, oh, 5 years or so. It was the Decemer after 9/11, my first ever trip to New York, & the World Trade Centre site was still smoking. The air was heavy with its citizens' breath & the skeleton of the devastated buildings were mapped out on each person's face as I passed them in the street. & I was meeting with R' Weiss to beg for his help to take one step closer in finalizing my sofrut education, a journey I had already been on most of my life. I won't do his message justice here, but he spoke of "positive Judaism" - a Judaism not defined by what you're against. Denominationally, most Jews seem to choose their camp based on what they cannot tolerate, rather than embracing what they believe is good & right (according to R' Weiss). He strongly encouraged us to avoid negative inspiration, as it doesn't last & deeply poisons us. He spoke of the war with Lebanon/Hizbullah this summer. He was there, too, as I was. I have tremendous respect for R' Weiss, because he is a firm, yet gentle Zionist; his Zionism is founded on Torah & not on fear or xenophobia. Israel, he said, is surrounded by terrorists. True, we have signed peace accords with Egypt, peace agreements with Jordan - but it's a cold peace. He spoke about how the whole of the Jewish People have a covenental relationship with G@d & the Land; ie, we do our part & G@d will do G@d's part. Some Jews forget this, that the Land is a gift in exchange for fulfilling our half of the deal G@d struck with us. It's a priviledge to posess &/or to live in the Land & not a right. The only thing G@d promises us in the Torah, said R' Weiss, is that the Jewish People will never be extinguished. We are eternal. However, if we don't do our part, then we will not possess or be able to live in the Land. The State of Israel is not eternal. It is an opportunity. & how do we support the current State of Israel in actualizing the final redemption? We can visit. We can say tehilim. We can do mitzvot. We can pray. We can give tzedaqah. We can learn Torah. We have to constantly earn the reward, or it will be taken from us, G@d forbid. R' Weiss said that G@d wasn't asking literally, "I can't see you, where did you go?". Of course he knew where Adam & Chavah (Eve) had hidden themselves - & why. G@d's question was more like, "Something has changed with our relationship, on your end - where are you at with us?" G@d wanted to hear His creations explain what was different for them, from their point of view. Teshuvah is the answer to the question "where are you?" My eyes filled with tears when he said this. As you can see. I'm cradling my newest scroll here as I absorb as much of R' Weiss' wisdom as I can. My Hebrew name is Avielah T'shuvah. T'shuvah is a name commonly given to girls born on Rosh Ha-Shanah, as I was. It's the feminine future construct of a word whose root can mean return, respond, repent, answer...like she is constantly in flux & re-paving her way toward her true self, to where G@d wants her. So naturally, this touched me deeply & has altered my prayer experience. I bless R' Weiss for that gift. After his inspiring talk I showed him my latest Megilah & he said it was beautiful. I thanked him because R' Ross Singer, my Rav, had consulted with R' Weiss (& other Orthodox rabbis) about me & sofrut & greatly helped me due to his influence. I owe him a lot, as do the women scribes coming after me. Suffice to say, I want to be like him when I grow up. Except for that being a man & a rabbi part. But you get my drift. We all have an ethical obligation to stand for something outside of ourselves. With G@d's help I'm turning my life's work into work for others' lives. These are the generations of No'ach. No'ach was a man righteous and whole-hearted in his generation; No'ach walked with G@d.
וַיֹּאמֶר יְהוָה לְנֹחַ, בֹּא-אַתָּה וְכָל-בֵּיתְךָ אֶל-הַתֵּבָה: כִּי-אֹתְךָ רָאִיתִי צַדִּיק לְפָנַי, בַּדּוֹר הַזֶּה. & G@d said to No'ach: 'Come you & all your house into the ark; for you have I seen righteous before Me in this generation'. Both times No'ach's righteousness is mentioned in the Torah, this quality is awarded him only in comparison to the common standard of times in which he lived. G@d judged No'ach's behaviour as higher than the staus quo. He was the best that G@d had to work with, & he "walked with G@d", but his righteousness was not absolute. Lucky for the planet, No'ach was "good enough". G@d could say, "he'll do". The name No'ach is spelled with 2 letters in Hebrew: Nun (נ) & Chet (ח). The word nach, from the same root, can mean "at rest", "to be settled", or..."quiescent". This may give us a clue as to why G@d considered No'ach not fully righteous, but relatively righteous. He did fulfill to the letter each comandment given by G@d; but no more. No'ach may have only performed the bare minimum of what was required of him. The bent Nun, which begins his name, denotes reliability. Sometimes our souls, our neshamahs, are withdrawn & resigned, in a state of contraction like the resting Nun, while at other times it is active and exuberant like the erect Nun. When someone is inactive and immobile, his/her soul lies fallow, but when this person feels vibrant and motivated, his/her neshamah draws itself up to its full height. No'ach was truly the Nun at rest. The name as well as the pictograph of the letter Nun means "fish". This is notable because of No'ach's survival of the deluge; &, like a tzadiq (righteous person), is associated with water. Our tradition tells us that when a righteous person dies without a perfectly clean slate & they still have a little bad karma - I'm paraphrasing here - to remedy, they are reincarnated as a fish. Why? Because fish are very quiet & lead calm lives in the most comfortable medium - water. The letter Nun has a gematrial value of 50. A word which also has a value of 50 is spelled Alef-Tet-Mem Sofit (אטם). If pronounced atam, this letter combination means "seal" or "shut" - filled up. If pronounced iteym, the meanins shifts to "sealed" or "water-tight". Etem is a seal or gasket. 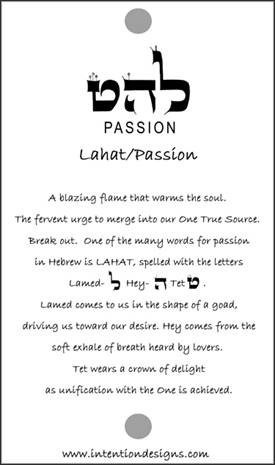 This is one of the words I wrote in a Sefer Torah. The middle letter is Chet, the way my sofer taught me to shape it. The letter Chet's name reminds us of the word chatoteret, a hump or hunchback. Indeed, when Chet is written in an Ashkenazi/European Sefer Torah, it consists of two Zayins - or a Zayin (ז) & a Vav (ו), depending on the philosophical leanings of the scribe - joined by a peaked roof. This is where Chet gets its name, from chat - "distorted" or "curved". This is also where we get the words chatah & cheyt from - sin, transgression, miss, fail. When we don't shoot straight in our lives, we fall. Our Sages draw a lesson from this construction; when one observes two people fighting, whether using verbal or actual weapons (Zayins) against each other, spare no effort to build a bridge and bring them together so they may join once again in friendship (Krias HaTorah). The numerological value of the letter Chet is 8. Going beyond seven, the Shabbat, the number eight represents our ability to transcend our physical limitations. Eight symbolizes the metaphysical, the entrance of the Divine into our lives. No'ach's name bears the gematria of 58 - which is the same as that of cheyn, grace. So much as this man may have helped save the inhabitants of the world from total destruction by doing as little as possible, he did, in the end, walk with G@d.
Sunday went beautifully, thank G@d. We started at 9am with all the children of the Jewish school, their parents, grandparents, & any other special people in their lives who they wanted to invite to share in the Torah-writing experience. It was gorgeous! You know, hundreds of people lined up to rest their hand on mine as I wrote in this Torah. It was amazing. Some even cried. It made me really think: I refused to practice sofrut until my teachers & rabbis gave me the go-ahead. Even though I'd learned it well with them & felt ready - ok, MORE than ready - to begin this sacred task I had yearned for since I was small, I knew it was wrong for me to call myself a soferet or to practice any of it until I was given permission by them to do so. Once I received my endorsement, then my work was finally kosher (if you accept sofrut from a woman, that is!). & I chose my teachers carefully, & they me, because to seriously, positively change the world you have to change yourself. They still mentor & challenge me. & when I first began to write, I have to admit, I was petrified. Who was I to interact with the holy letters in this way? Just because I was certified didn't mean I was an expert yet. It's like when you finish journalism school or are ordained as a minister - you're totally qualified, but you lack experience. You're a baby. & I was a baby soferet. & terrified of making any error, visible or invisible, even by accident. I felt the weight of all the Jews who might rely on me to provide for them what they needed. It was hard. & yesterday I had the solemn privilege to witness other people's very intimate reactions to my writing a letter for them. The searing love I saw in their faces for this scroll, which some may not have even been able to read, was palpable. This is the Torah, Eytz Chayim Hee! I am so lucky! Barukh Ha-Shem! There were yummy little kids, oldsters...what a blessing! One very elderly man came up to me on his turn - he must have been 100 years old if he was a day - & he looked me in the eye. Like, right through me. & I asked him what his name was. I was expecting "Max" or "Benny" or some other anglicized name for a gent of his generation. But he gave me his Hebrew name. He pronounced it proudly with his heavy Polish accent: "Barukh ben Chayim Pesach!" & I was just held, transfixed, by this man's presence. He kept staring right through me & he repeated his Hebrew name: Barukh ben Chayim Pesach. Then he held my hand & we wrote a letter together. I later learned that this man walked away from my writing table with tears in his eyes, saying, "I'm 95 years old & that was the most important thing I've ever done." & this went on all day! What a great experience! I'm so blessed! & there was a 6-month-old baby girl too! Her parents held her over the Torah & put her teeny delicate little pink hand on mine as I wrote, her eyes wide. 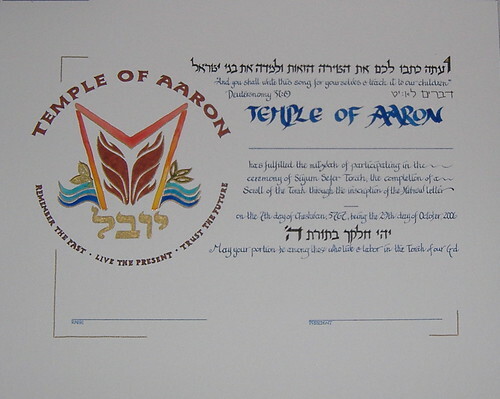 I must thank everyone at Temple of Aaron for making me feel like I was part of their family. They honoured me by trusting me with their Torah & really, with their hearts too. & I hope I brought to them whatever they needed from me. If, in the end, we've all drawn a little closer to Torah, & thereby a little closer to G@d, that is the greatest gift we can share. 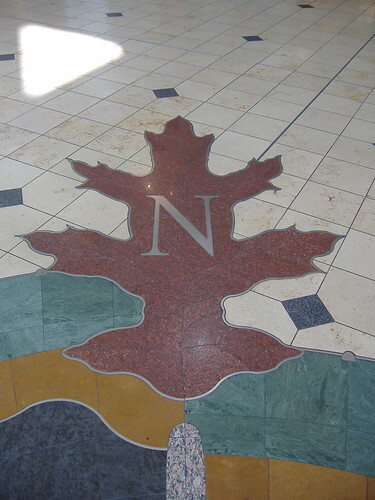 I must say, the airport here has the coolest floors! Happened to find myself listed here (scroll down). Very odd. Nice, tho'. Shavu'ah tov! A good week! & don't forget to set your clocks back an hour! This article appeared in the Pioneer Press this morning. I must thank Steve Scott, the paper's religion editor, & Craig Bork, the photographer, for their excellent work. Little kids were coming up to me today at services & saying, "hey - HEY! I saw you in the paper this morning!" They were so cute. Since when do small children read the Saturday morning news? I spoke last night before Shabat dinner, just toward the end of services, to about 300 people (so I'm told). They were really good about my not using a microphone on Shabbat, & thank G@d I think I reached most everyone. I've been staying with Rabbi & Mrs Konigsburg & I just adore them! They've been so kind. & as an extra blessing, they only live about a block from the synagogue, which makes all the difference in the world to me. This West Coast girl gets cold easily. I did a little show & tell today with part of the Hebrew school & then later spoke on some letter-midrash. All in all, my patrons, students & audience have been very enthusiastic. People are very sweet in the Midwest, ken ayina hora. & tonight after Shabbes I had the great honour of going to Rabbi & Mrs Raskas' home for dinner. They were really lovely hosts with a very sharp Judaism. I like them. We drank rye - which they call "VO" for some reason - neat & talked Jewy-feminist-Halakhah. They both have some great stories to share. 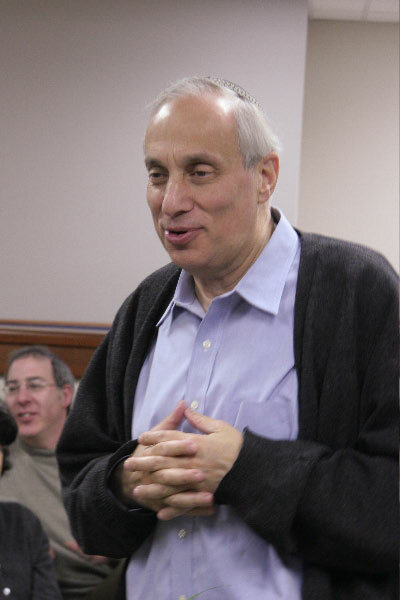 He went to school with such luminaries as R' Harold Shulweiss & apparently "used to hang out with Kaplan". & no, not this Kaplan. THIS Kaplan. The writing was on the wall when she saw "Fiddler on the Roof" as a 3-year-old. Mesmerized by the Hebrew letters she saw in the movie, Avielah Barclay sensed a sacred calling that would not let her go, until decades later she became the only female Torah scribe in all of Judaism. In a St. Paul synagogue this weekend, she will do what no Jewish woman before her has done for at least 250 years: inscribe letters in a Torah scroll, one of the holiest acts of Judaism. "The Torah is the heart and soul of what the synagogue is all about,'' said Rabbi Randall Konigsburg of Temple of Aaron, celebrating its 50th year in its synagogue on Mississippi River Boulevard. "So our congregation is very excited about having her here." They're not the least bit opposed, either, to having a female scribe — a soferet — put quill to scroll. That hasn't been a universal response. Barclay, an Orthodox Jew from Vancouver, British Columbia, has been accused of heresy. There will be plenty of that during Barclay's visit to Temple of Aaron this weekend. The highlight is Sunday, when she will help several hundred congregants fulfill a Jewish commandment by writing a letter in the Torah. "That's a lot of letters to be written all at once in one day,'' said Barclay, 38. Her apprenticeship as a scribe was more laborious — and painful. She was a gemologist 15 years ago when a bicycle accident derailed her career. Her writing hand was crushed against her handlebars. "I'm bionic now,'' she said, alluding to the pins and screws that keep her hand together. A long period of recovery prompted a soul search that harked back to the movie house of her childhood. "My dad used to manage movie theaters, and I would go with him during the day while my mom worked,'' Barclay said. "I must have seen 'Fiddler' a hundred times. What followed was another long search: to find a mentor who would teach her the methodical and intricate craft of writing Torah. Barclay couldn't find a sofer willing to risk his reputation by teaching a woman. 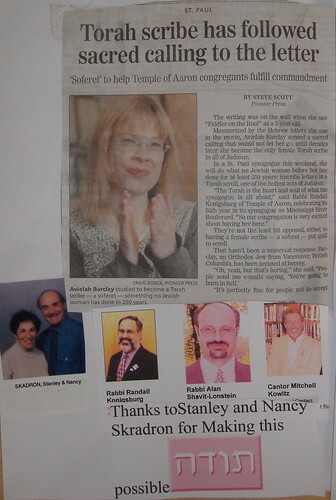 "They discussed it in the Talmud, whether a woman could write a Torah,'' said Rabbi Emeritus Bernard Raskas, who saw a magazine article about Barclay that prompted him to encourage Temple of Aaron to invite her to St. Paul. "Until I got this e-mail one day,'' she said. "I wasn't going to open it. I thought it was from a Jewish dating service. But I looked at it, and it was from a sofer in Jerusalem. "He said, 'I like your Web site. But I thought your calligraphy could use some work.' "
He agreed to teach her calligraphy. It took several years, and careful research by her home rabbi in Vancouver, to persuade the Jerusalem sofer to help Barclay complete a full apprenticeship as a soferet. Since being certified three years ago, she has helped other synagogues complete a Siyum Sefer Torah, the restoration project like the one at Temple of Aaron this weekend. She has written the Book of Esther for congregations to use during Purim. And she is negotiating with some West Coast congregations to write an entire Torah, a process that can take up to two years. 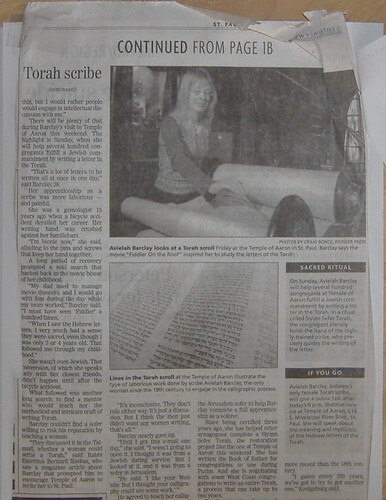 Barclay also has discovered as many as 10 other women who were Torah scribes, but none more recent than the 18th century. "I guess every 250 years, we've got to try to get another one,'' Konigsburg said. Steve Scott may be reached at 651-228-5526 or sscott@pioneer press.com. Avielah Barclay, Judaism's only female Torah scribe, will give a public talk after today's 6 p.m. Shabbat service at Temple of Aaron, 616 S. Mississippi River Blvd., St. Paul. She will speak about the meaning and mysticism of the Hebrew letters of the Torah. On Sunday, Avielah Barclay will help several hundred congregants at Temple of Aaron fulfill a Jewish commandment by writing a letter in the Torah. In a ritual called Siyum Sefer Torah, the congregant literally holds the hand of the highly-trained scribe, who precisely guides the writing of the letter. On my way here today as scholar-in-residence for their Siyum Shabbaton. I'm really excited to meet Rabbi Raskas, who is one of the people responsible for bringing me in, & a well-known & well-loved theologian, rabbi & community leader. What an honour, barukh Ha-Shem! I really appreciate the opportunity to do some artwork occasionally & not only sofrut - grateful as I am that I can make my living at sofrut, thank G@d.